Before the work gets started, we need to get to know each other. In our initial discussion, we explore how we might be able to work with you. Talking through your general needs and goals sets the right mindset for going on this journey, clarifies what you want to get out of a potential relationship, and helps us to ask the right questions later once we start getting into the details. In order for us to help you, we need to know you. If there is a good fit, we would then arrange an in-depth meeting to go over your current financial situation, your risk temperament, and your experience and knowledge with investments. To prepare for this meeting, we will send you an organized data checklist to help you provide us with the financial materials that enable us to assess your current financial situation. We analyze this information and have a mocked-up initial draft of your balance sheet, tax projection, and cash flow statement to review at our in-depth meeting. We will also talk through a financial philosophy questionnaire that will help us understand your experience and knowledge with investments, your investment preferences, and what keeps you up at night. After we come to a firm understanding of your current situation and temperament, we then move on to the exciting stuff. We look into your future by coming back to the question of what you hope to accomplish with a financial plan. Together, we catalog your financial objectives, i.e. what you want to fund. People tend to have a wide range of objectives such as securing funds for retirement, building an estate legacy, sending a child to college, caring for a handicapped child, accumulating funds for a charitable bequest, and many others. We also reflect on your financial goals, i.e. what you want to accomplish. We explore what financial independence means to you, when you want to achieve it, reducing taxes, and what would make you feel comfortable about your financial affairs. We want to understand what would help you sleep better at night. We then talk about your dreams and what you would do if you had more resources, or what would be nice to have. This is an exploration of what is possible. Objectives, goals, and dreams provide the vision, focus, and direction for what we are shooting to achieve with your financial plan. At this point, we would take all the information about you and develop a plan, i.e. 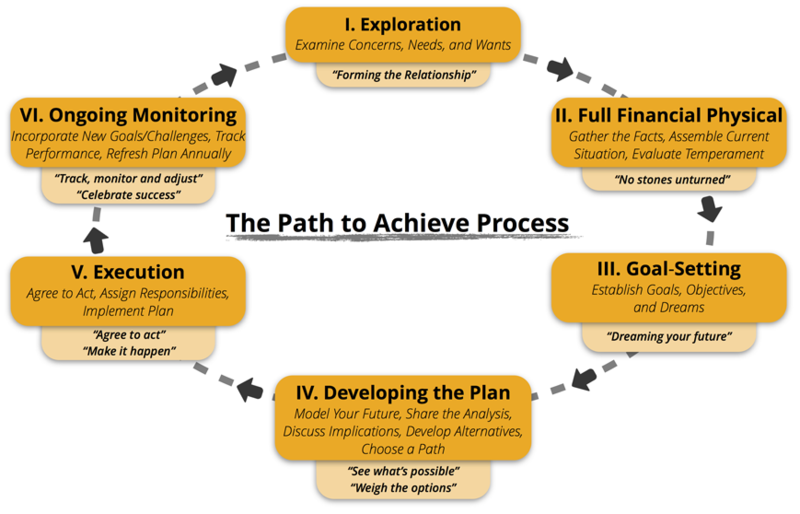 a strategy or path to meet your financial goals and objectives. This will include a projection of your financial situation into the long-term future using assumptions that you choose. The projections will help us look at whether you can achieve all your short-term and long-term goals according to your current situation. We share these analyses with you and examine together the various tools, strategies and options available to help you achieve your goals. If you can meet all your goals and objectives, we talk about how you can enhance your situation, e.g. improve your lifestyle or taking less risk. If you can’t, we review options for a path that will get you there and help you choose the path that is best for you. Once we have agreed on a plan, we then need to agree to act. This includes being clear about which aspects we take care of versus which aspects would require follow up by you. Many clients favor us in the role of quarterback where we direct the activities that are required. If new products are required, we can help facilitate choosing among options and vendors. If specialists such as estate attorneys or accountants need to be consulted, we can refer one to you if you don’t already know one. There is no obligation to use us to implement; you are free to use any other advisors you like. However, 95% of the people we work with use us because the one-stop approach eliminates the need to re-explain to others what to do. With us, there is no transaction costs; we are on retainer with no clock running. Throughout the year, we monitor your situation and investments and are available to talk through any questions or changes to your situation. When we discover an opportunity that is good for you, such as a shift in the economy or a change in tax law, we contact you. We are proactive, not reactive. If an opportunity comes to you, you would bring it to us to determine two things – is it good and is it good for you. We strongly believe that for a financial plan to be effective, it must be current. Every year we restart the process by developing a brand new plan update. We incorporate new developments in your life, changes to your financial needs, and a refreshed analysis of your financial situation as of the new year. We review your progress toward achieving your goals and objectives, talk about emerging issues, and explore alternative paths to achieve, if necessary. After achieving a financial goal or objective, we recognize and celebrate the success. We then look forward to what new goal and dream you can achieve.